Within two months, I have seen two theatrically-released movies by director Scott Speer, both of them with wildly different levels of quality. The first was Status Update, which – as you may remember from my pretty scathing review of it – I was not a fan of in the slightest, to put it mildly. Now, along comes teen weepie Midnight Sun which has everything that Status Update most certainly did not, namely a plot that made sense within itself, characters that were worth caring about, humour that actually scored one or two laughs, actors giving proper and realistic performances, and a grounded sense of being, to name but a few. This has led me to believe that there are two working directors out there right now who both happen to share the same name with each other, because I refuse to believe that the Scott Speer who directed Status Update also made Midnight Sun, which may not be great and certainly has a few problems of its own, but still might as well be a goddamn masterpiece in comparison to whatever the hell you’d call what came before. It might surprise some to learn that this movie is actually not based on a book, especially since it seems like it was made to capture the zeitgeist left by The Fault In Our Stars, but rather it is an English-language remake of a 2006 Japanese film of the same name. The plot is virtually the same as that one, as it follows a teenage girl named Katie Price (Bella Thorne) who suffers from a rare disease that causes her to fall ill at the mere exposure of sunlight. As a result, she is kept inside during the day with only her father (Rob Riggle) and best friend Morgan (Quinn Shepherd) for company, and only goes out at night to play guitar by the train station. 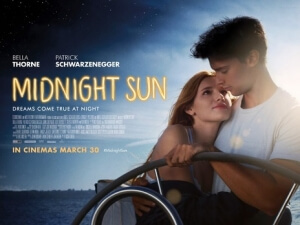 One night, she is approached by Charlie (Patrick Schwarzenegger, son of Arnold), the former high school swimming champion who Katie has seen pass by her window for years, and they begin to develop a relationship – only that Katie has thus far neglected to mention her illness, which is slowly threatening to take her life day after day. Now, I know what you’re thinking; they’re taking an AWFUL lot of liberties with this biopic of reality show star Katie Price, and the filmmakers should count themselves lucky if she doesn’t sue them. Joking aside, as far as teen illness romance dramas go, this is no Fault In Our Stars, but it’s passable enough due to its own little qualities that are worth mentioning as points of merit in this movie. For one, the acting is really solid by (mostly) everyone; Bella Thorne is a likeable lead in this, and she makes a strong case here for being in more lead roles in movies other than just the bitchy high school enemy she usually seems cast as, and Rob Riggle gets to really show that he’s a shockingly strong dramatic actor, getting some of the best scenes in this movie just from his wonderful performance alone. Sadly, I cannot say the same for Patrick Schwarzenegger, who is easily the weak link in an otherwise solid cast; his delivery is very flat and uncertain most of the time, kind of like how his father struggled early in his career when he could barely speak a word of English, and he struggles to have any believable chemistry with the actress who’s playing his love interest (hell, Bella Thorne has way better chemistry with Rob Riggle, and that’s strictly a father-daughter relationship). It doesn’t help that his character is written to be the blandest possible male romantic lead this side of a Nicholas Sparks novel, but judging by his performance in this movie, young Schwarzenegger has a long way to go if he’s to have the same kind of screen presence his father has. While the movie certainly benefits from some really strong performances, I can’t say that this is necessarily a great movie based on that alone. There are times in this movie, several in fact, where the drama gets way too manipulative, clearly cranking up the on-screen sadness to mine a tear or two from you, and that manipulation is certainly felt in every scene where actors shed tears every other second (in fairness, they do it really well, but that still doesn’t excuse it) and especially in the third act which goes all out in trying to make your heartstrings go wild, to limited success. The main romance plot in this movie, tends to falter a lot as well, although that’s largely down to how Thorne and Schwarzenegger don’t have particularly profound chemistry together, and when they’re together on-screen you feel like they’re just reading lines more than acting like they’re really into each other. Again, some of the film’s best scenes are between her and Riggle, or even her and Shepherd who has her own little arc in the film with a dweeby co-worker at the ice cream parlour where she works. Overall, there’s just a saccharine taste to lots of it that not quite as sickly sweet as a Nicholas Sparks movie, but it still hinders the movie from being the profound and genuine movie that it could have been. However, regardless of the film’s quality, I still can’t shake off the fact that this is directed by the same Scott Speer who less than two months ago gave me the experience of sitting through the worst movie of the year (so far). I still think that there are two directors with the same name who just happened to release two different films so close to each other, but even though Midnight Sun isn’t a particularly great movie, it might as well be a bloody sensation after the last movie by this guy. Midnight Sun may not break new ground in the saturated teen illness romance drama sub-genre, but it’s got some strong acting by most of the cast, and regardless of the quality is a far better product by this director than Status Update was.